I have recently been reading about the Romantics and Romanticism. Romanticism was a broad cultural movement that began in the mid eighteenth century. It drastically changed literature, the visual arts, philosophy, poetry, etc. It was born out of a reaction against industrialisation, mechanisation, and basically all the negative aspects of civilisation that we know today. Just like many of us today who dream of moving to a nice cottage in the countryside in order to live the “simple life”, the Romantics harked back to a time when life was “easier,” “more natural” and “rustic”. The Romantics idealised the medieval world and renounced the Enlightenment’s rationalism and order, in favour for the expression of authentic emotions and feelings. Among them was a strong sense of duty to change the unnatural world, and to use their arts and poetry to inspire others in order to change society. The painting depicts the seventeen year old Thomas Chatterton (1752-70), a Romantic poet whose suicide (although there are debates as to weather he did commit suicide or it was a case of self medicating gone wrong) left him a legacy of the melancholic and tortured artist that continues today. Chatterton published a collection of poems in the name of Thomas Rowley, a 15th century monk, which he passed off as medieval manuscripts. Chatterton left his job working at a scribes office. He struggled to earn a living from his poetry and was near the brink of starvation, and that same year he apparently poisoned himself with arsenic. Wallis next painting after Chatterton was The Stone Breaker (1857), which is another of his great examples of social realism, especially in the Pre-Raphaelite circle. The painting depicts a dead man slumped against a mound. The public and press saw the painting as a justified criticism of the Poor Law, which forced paupers to break stones to repair roads in return for food and shelter. The realism in the The Stone Breaker is quite different to Chatterton, where high drama in the pose of Christ likens him as a martyr of the struggling artists in the new industrial age. But the poor slumped dead man has a deep depressing sense of pity. In Chatterton, the torn poetry, bottle of poison, and incandescent bright colors all add to the drama of the scene. Wallis approaches Chatterton with more romanticism than he does with The Stone Breaker. As with most Pre-Rahaelite works Wallis used a model, George Meredith (1828-1909), who was about 28 at the time. Two years later Wallis eloped with Meredith’s wife, a daughter of the novelist Thomas Love Peacock (1785-1866). You can always count of a bit of drama in love with the PRB! 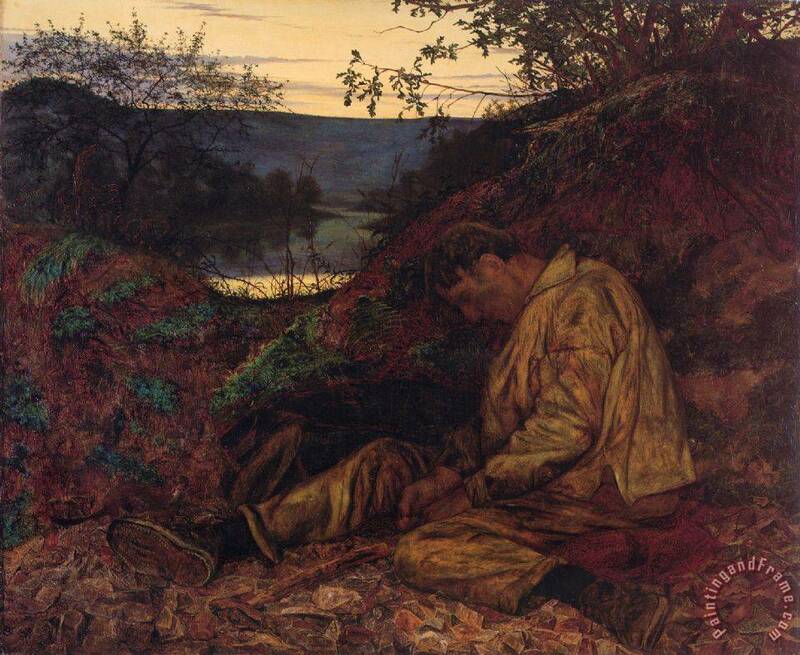 Henry Wallis, The Stone Breaker, 1857, oil on canvas, 654 mm x 787 mm, Birmingham Museum and Art Gallery. Death of Chatterton was described by John Ruskin (1819 – 1900) as “faultless and wonderful”. At the Art Treasures Exhibition in Manchester in apparently drew large crowds (1857), and it was also exhibited in Dublin in 1859, and was one of the most popular Victorian paintings in reproductive print form. Then, Wallis sold the painting to Augustus Egg in 1856, and Egg sold the right to make engraved reproductions. The painting became the subject of a court case after Dublin photographer James Robinson was inspired to recreate the painting as a tableau vivant so he could sell photographs of the scene. John Ruskin as a champion of the movement also promoted the Gothic style and helped to reinforce the group’s sense of moral commitment and social awareness. He envisaged art as a means of saving the human race and fulfilling the most important human aspirations, in stark contrast to the pretense and artifice of academic painting, Pre-Raphaelite art has a new way of looking at life, and at techniques used by artists before the time of Raphael. Studying nature in detail to rediscover its inner meaning, the Brotherhood sought to communicate with the forgotten sources of spirituality. Are there any key works, pieces of literature, or poetry that represent Romanticism to you? Let me know in the comments section!